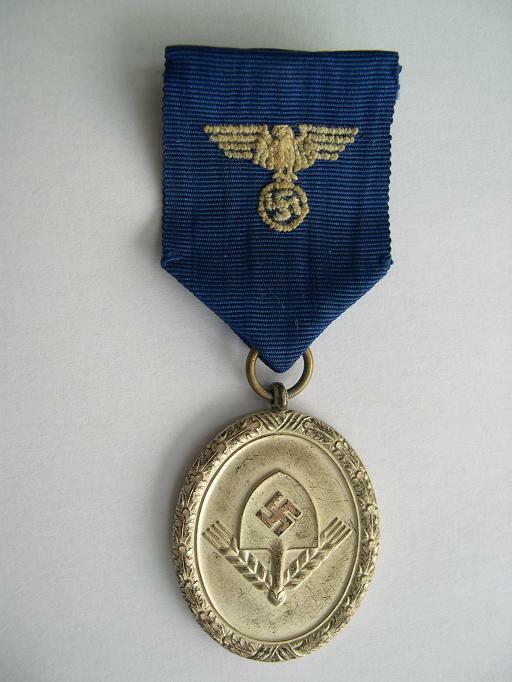 Lets see some RAD Medal Bars. Here is one of mine. Now that is a RAD bar ! 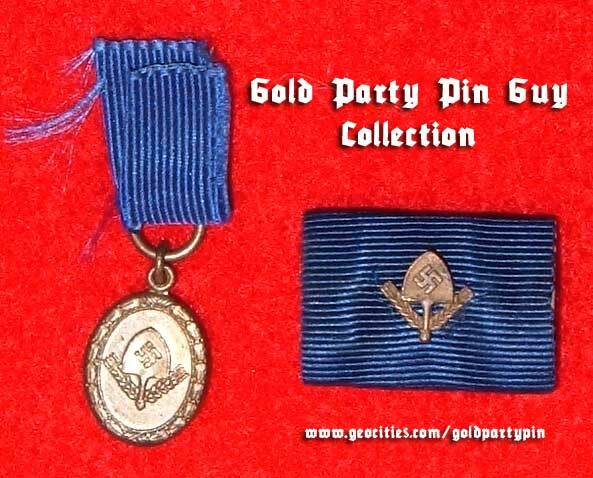 Did the full size 12 year medals have devices on the ribbon ? 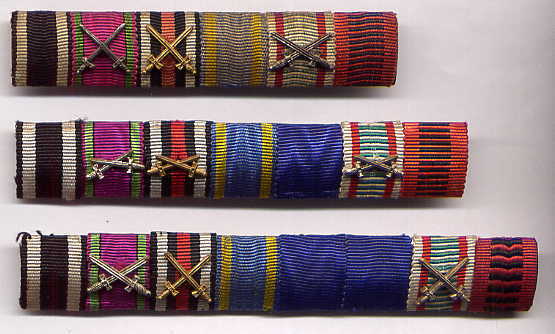 12s and 4s only had ribbon bar devices for a few months in 1940, after which the useful little RAD emblem devices were abolished. 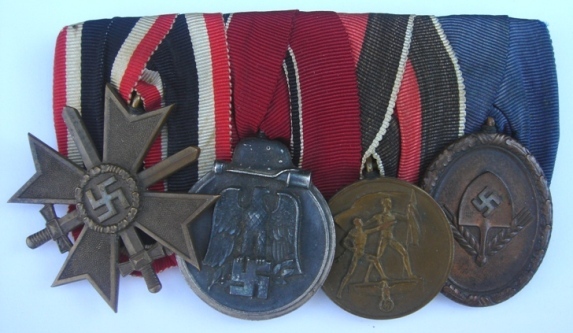 18 and 25 year medals had eagles on the ribbon and medal bars. 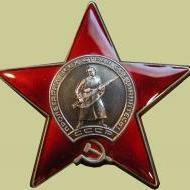 Any pics of the RAD eagles or devices ? Nice bars, guys! Rick, where have you been hidding that one!!! Herewith RAD's with embroidered eagles. I've only seen a couple for sale in 40 years collecting! Here's my only contribution - a full sized single bar with the rare device in bronze. I've also thrown in my mini bronze RAD medal. The ribbon is not correct, but it came that way. Maybe I lied. 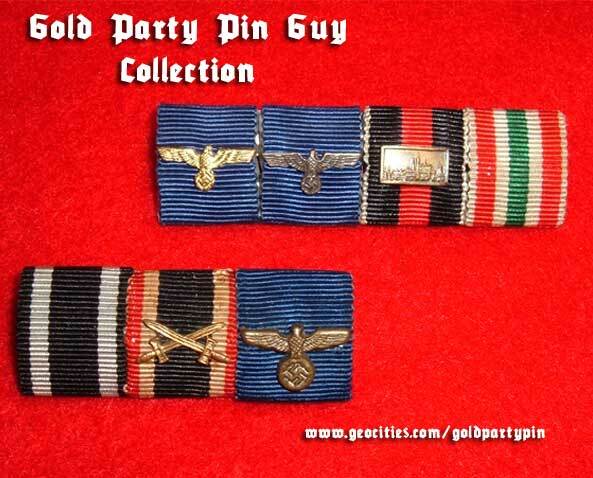 I just had a look at a few of my bars and one I assumed was an early Wehrmacht long service bar and eagle now looks to me like an RAD eagle device (the 3-ribbon bar below). 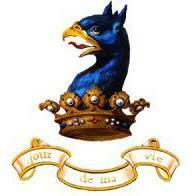 I've put a bar with two Wehrmacht long service eagle devices above it for comparison. Those are the ONLY embroidered ones I have EVER seen in 40 years outside the illustrations in the "B?nderkatalog," Stan!!!! 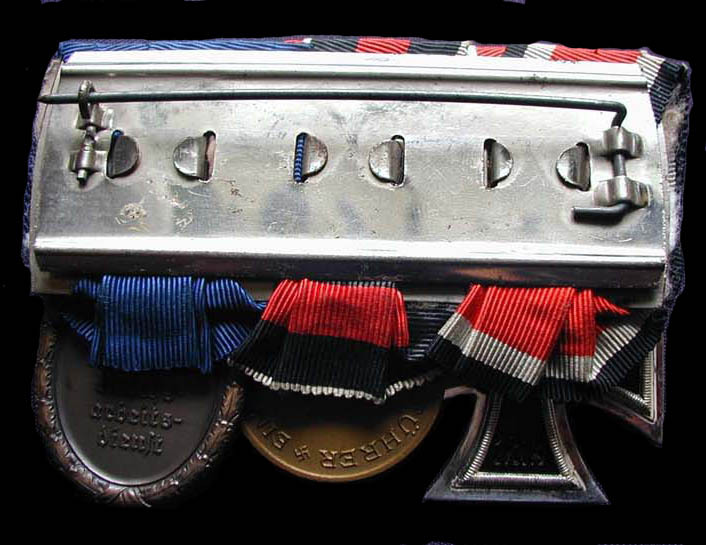 No, that lower 3 ribbon bar device IS a Wehrmacht one-- note the rounded wing tips. It's just a style of the eagle from a specific manufacturer. Here are the 1940 devices for 12 and 4-- quite useful, eh?-- and a 25. Notice the very distinctly shaped eagle used for the RAD 25 here and on Stan's above. Those are even rarer than the shovel devices. 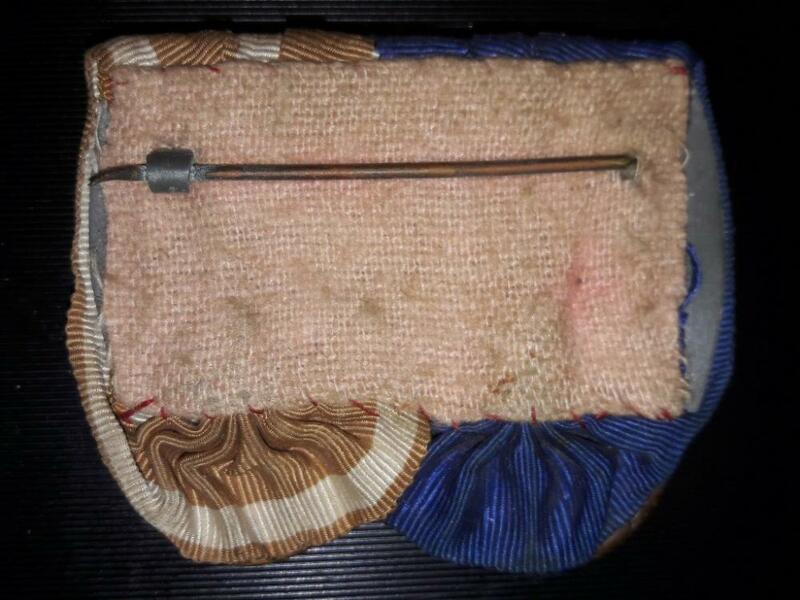 I've seen ecxactly ONE metal 18 RAD ribbon bar device, and this is only the second ( Gerd!) RAD 25 I have ever seen-- or owned. The OTHER RAD 25, which I sold pre-internet, was also a single. 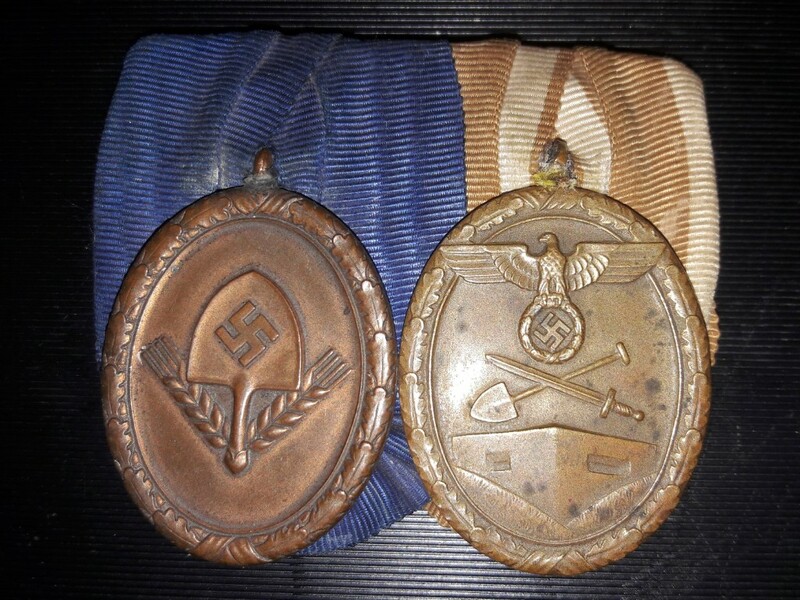 I have never been able to find a single official reference as to when, why--or indeed, whether--DOUBLE RAD long service awards were authorized to be worn "Wehrmacht style." Presence of doubles on bars with 1940 devices suggests that year, certainly... but it has never been clear to me whether two ribbons was ALSO as unauthorized as the shovel devices, and was later rescinded or banned. 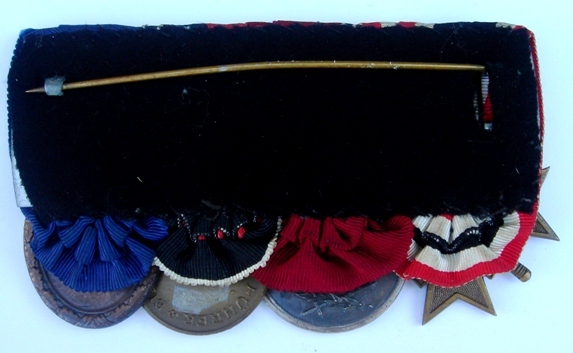 Although the unique WW1 ribbon identified the original owner THEN, it was only the none-one-two that allowed recognition of this-- and research has verified the ID-- of these as RAD long services at all. 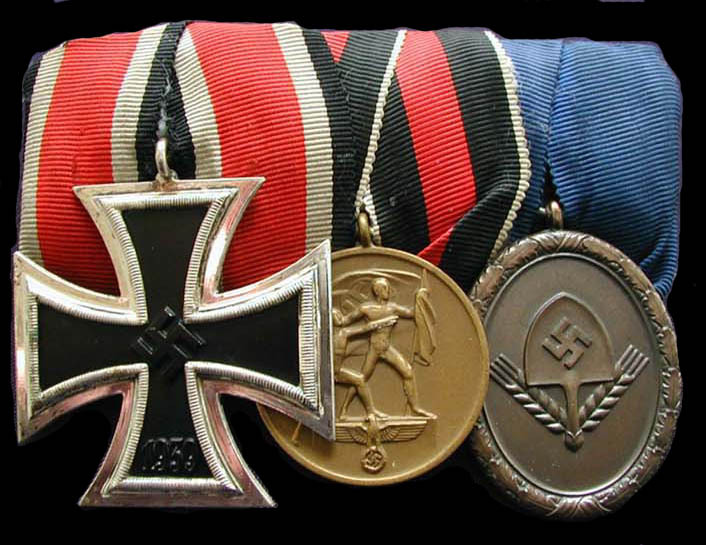 One "plain blue" could be any of SIX Prussian or SIX Third Reich awards-- but only the RAD wore TWO. 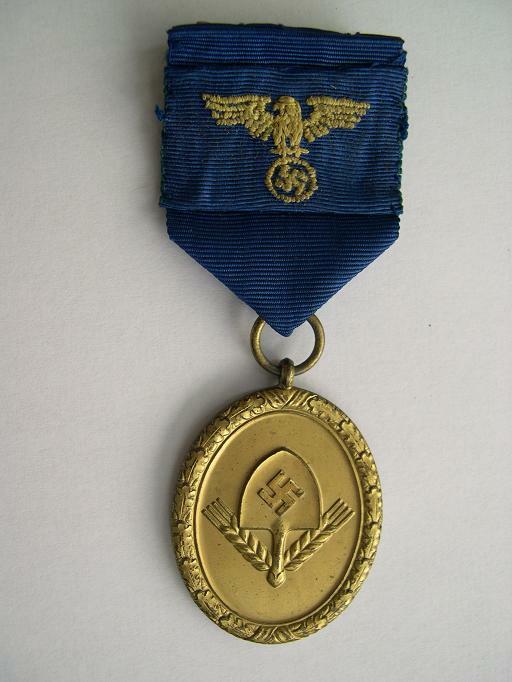 The regulation RAD eagle devices look very much like miniature SA and NSDAP 1938+ cap eagles, in perfect proportion. While both have uncut flashing under the beak, Schickle's mutant looks like that Egyptian Ibis-god, or one of those "Star Wars" drones battled by Jar-Jar Binks--cartoonish-- while the RAD has the strong, well formed square head of a real bird. Thanks for clearing it up Rick - the chunky style had me going for a while there. 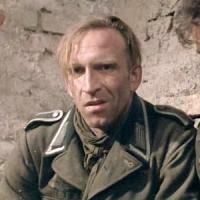 Wehrmacht it is. Did the servicetime count double in wartime also for the RAD? I see no other way to get a 25 year service award in an organisation, which was formed only in 1931!? absolute, total, impenetrable lack of documentation. A very nice bar and probably from a member of an early construction crew involved in the building of the 'Westwall', or a later member of a 'Flak Abteilung' after the defences were garrisoned prior to Allied Invasion. Quite a hard combination to find....congrats!